Making the use of DME and the Medicare Therapeutic Shoe Program easier. Required forms will be mailed to you once you have entered registration information. Log onto Internet-based PECOS with your NPPES User ID and password. We can electronically bill Medicare for you at NO ADDITIONAL COST to you. If SafeStep provides electronic billing, Medicare payments are sent directly to you, 2 – 3 weeks following fitting of shoes. If your Supplier number has expired, it is necessary for you to reactivate it by resubmitting the same SafeStep Supplier registration form. To check your activation status, you can call the National Supplier Clearinghouse, toll free at, 866.238.9652. 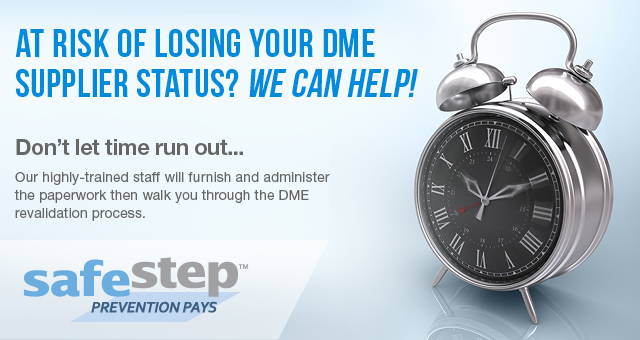 Medicare requires DME suppliers to update information and pay a registration fee every three years. SafeStep will provide a reminder and send all required forms, FREE OF CHARGE.